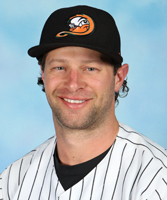 Nieuwenhuis enters his first season with Long Island and 12th in professional baseball. The six-year MLB veteran spent four of those seasons with the New York Mets (2012-15), also suiting up with the Los Angeles Angels (2015) and Milwaukee Brewers (2016-17). He appeared in 414 MLB games, compiling 31 home runs, 117 RBIs, 128 runs, 59 doubles, 20 stolen bases and a .986 fielding percentage. The California native hit .252 with seven homers and 28 RBIs over 91 games during his first season in The Show.